Hey guys! I know it’s been a while since I’ve posted, but I’ve been really busy. I’ve had to worry about both normal testing and AP testing. With that being said, I’m not sure how much I’ll be posting over the next couple of months, but hopefully, I’ll be able to get a few posts in since this week is TAKS week. 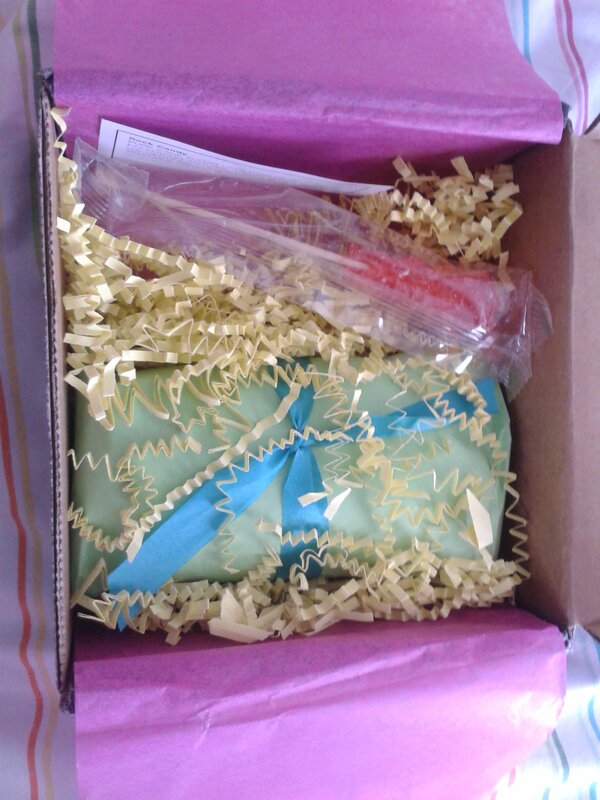 So for this first post, I want to share my April Julep box with you guys. I actually got the box really early, it was at the end of March. 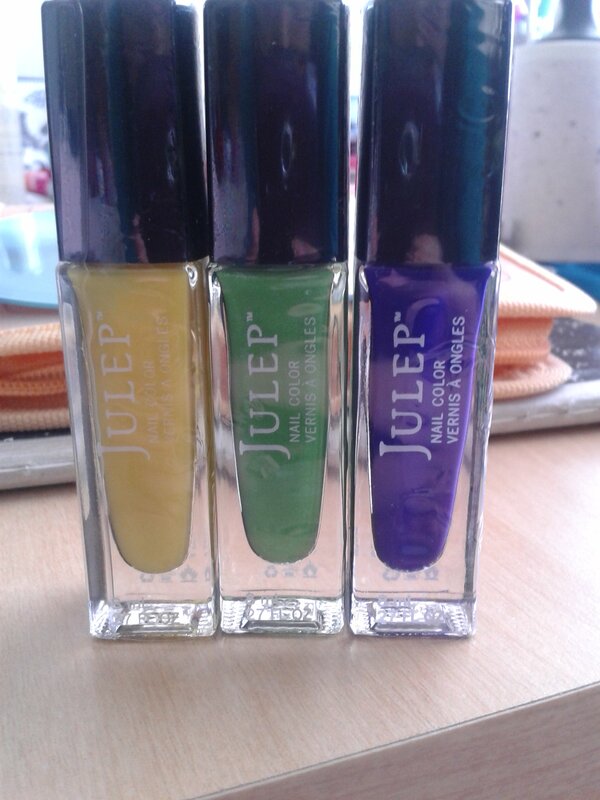 That’s one thing I really like about Julep- you get the package before the month even starts. Anyways, I took pictures on my phone the instant I tore open the package, but I’ve been too lazy to make a formal post. Now that the rest of this week is going to be relatively chill, I decided, why not post it now. So here we go! This month’s theme was “Turn on the Brights.” To go along with the theme, they packaged the products in bright colored tissue paper and it just looked über cute. 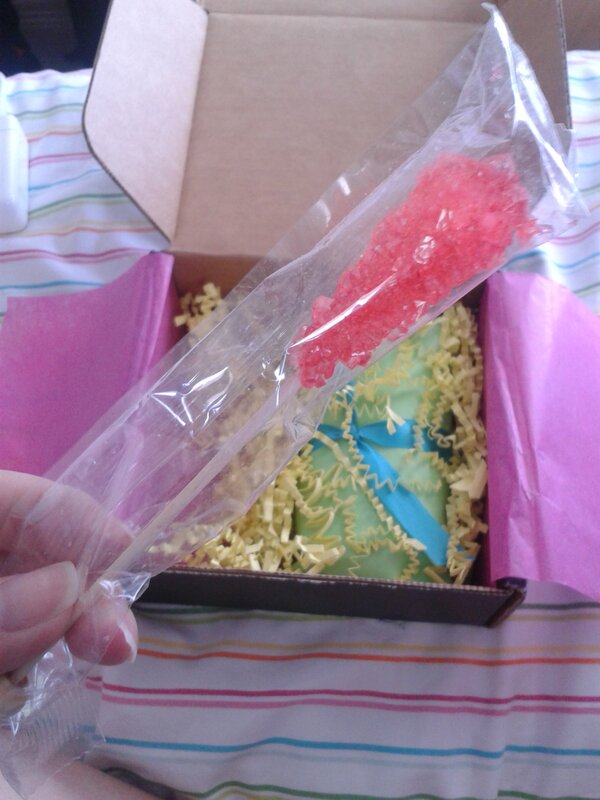 This month’s bonus gift was a pink rock candy! Yum! 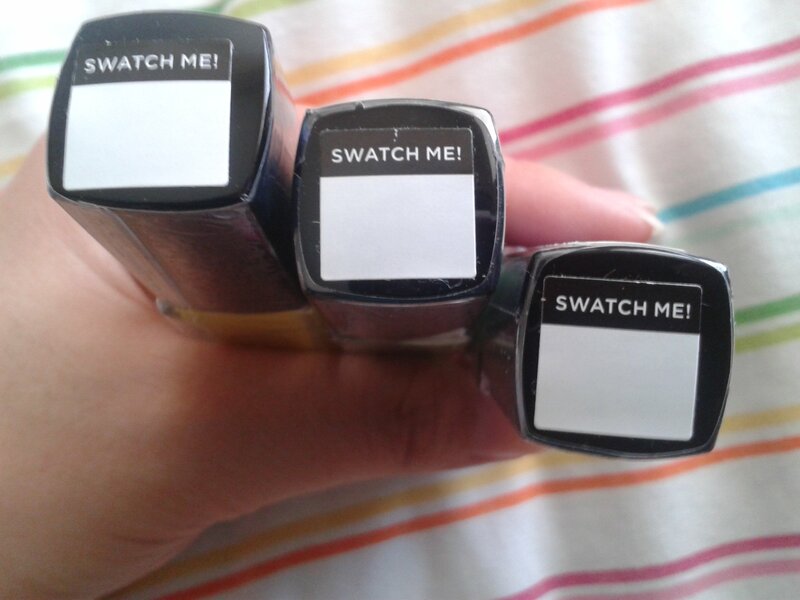 The boxes also now include the “Swatch Me!” Stickers. I’m not sure how long they’ve been doing this since my last order was in February, but it was a pleasant surprise for me. While I was glad that they sent the stickers, I wish they put them on a page so that you could peel them off yourself. Since they placed the sticker on the top, you would have to remove it swatch the color. Obviously, this isn’ that big of a deal, but it would help the stickers stay intact longer. Whatevs, I’m just a demanding person. I chose this box over the others because the rest of them came with the new dry shampoo. While I appreciate dry shampoo and wouldn’t have minded trying it out, I would rather have nail polish. 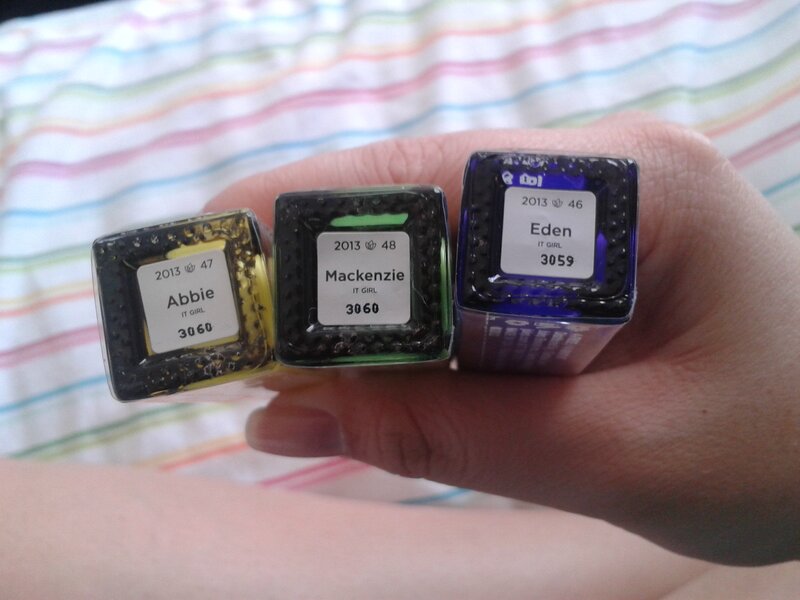 Since I didn’t choose a box with the dry shampoo, I got 3 nail polishes instead of the standard 2. I actually really like this color. It’s unlike any yellows that I have, and unlike any that I’ve seen at the drugstore. The only thing is that this color is very sheer and you may need to apply more than 2 coats. You also need to make sure you use a base coat. 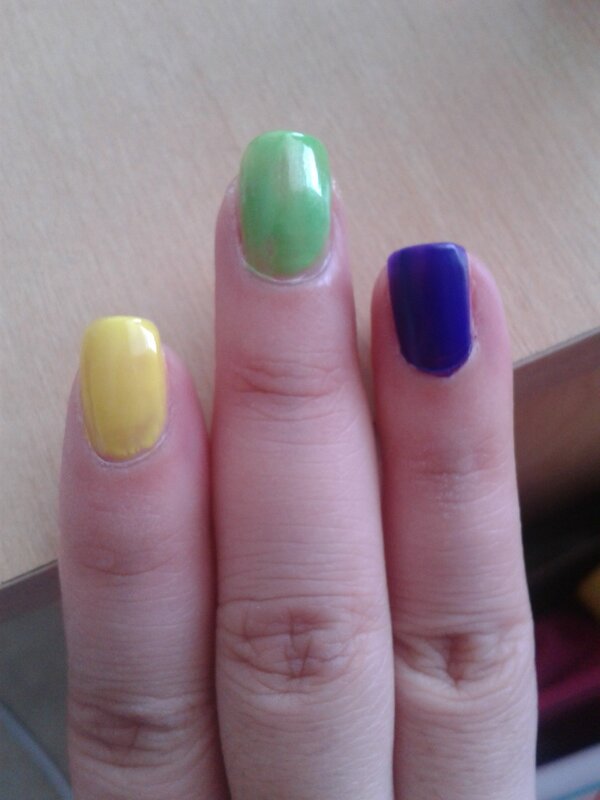 I applied the color to a finger to test it out, but I was too lazy to take it off, so I kept it on for about a week. Once I removed it the color, if left my finger yellow, and it’s been that way for about 2 weeks now. I feel like this is a very accurate description. The “frost” is spot on since it has a pearly sheen to it. This too is unlike any green I’ve really come across. This color, like the yellow, is very sheer and can stain your nails. This polish, out of the three, might be my favorite, but this might be due to my bias towards purple. I’m not sure I would categorize this color as a bright violet. Clearly, it is purple, but I think it’s more on the blue side. It has a matte looking finish, and I just really like it in general. This one doesn’t stain your nails and requires two coats. Overall, I was very pleased with this box. 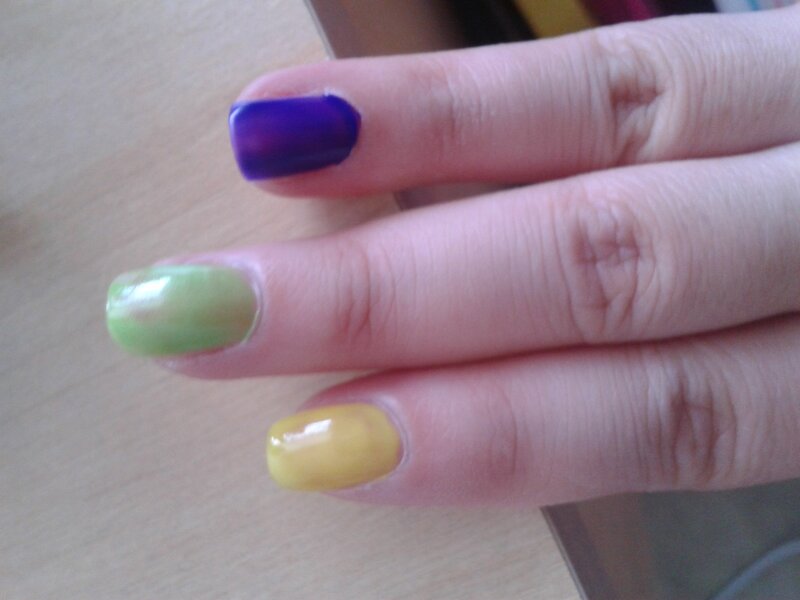 I haven’t done an actual manicure with any of the colors yet, but I’m hoping that I’m able to do one soon. What did you think of the April Box? Did you have any favorites?